NEW YORK (CNNfn) - The year 2000 moved across the Asia, Middle East and geographically-significant Greenwich Mean timelines Saturday with little incident besides celebratory hoopla, as governments and businesses reported few major Y2K-related computer problems that some feared could create global technological chaos. Most countries, including New Zealand, Russia, India and Germany said that banking, transportation systems and utilities were all working normally -- so far. There were also no reported problems after midnight struck across the 0 degree longitude line -- popularly known as Greenwich Mean Time, named after Greenwich, England which lies directly on the line. The rollover to 2000 there -- at 7 p.m. Eastern Standard Time -- was being closely watched as a barometer of possible Y2K computer problems since airlines worldwide and most satellites coordinate their computer operations with that timeline. Even in Russia, China and Pakistan, three countries viewed as particularly vulnerable to Y2K problems, no initial trouble was reported. The International Energy Agency said it saw no reason to release emergency petroleum supplies after its member countries reported no disruption so far to world oil supplies due to the millennium bug. In fact, the only significant problem of note appeared to be overcrowded mobile telephone networks, as tens of thousands attempted to contact friends and relatives shortly after the new century dawned in their respective countries. Rick Harder, vice president for Y2K operations at BellSouth Corp., said customers were experiencing delays in obtaining a dial tone shortly after midnight in some areas. The delays lasted for about two hours in New Zealand and one hour in Australia. Similar delays were reported in China, Japan and the United Arab Emirates, as well as scattered incidents across Europe, but all companies reported the congestion cleared up quickly. In Japan, there were reports of three equipment malfunctions at nuclear power plants early Saturday, although the problems appeared confined to the plants� radiation monitoring systems, which shut down shortly after midnight. Japanese officials said two of the malfunctions were reported at the Shiga nuclear power plant about 186 miles northwest of Tokyo. The malfunction prevented workers there from monitoring data on radiation emitted from the plant, but officials there said five on-site checks showed radiation levels were normal. Similar disruptions occurred at a nuclear plant in Miyagi, but order was restored 10 minutes later with no disruptions to power generation. The exact cause of the problems was still being investigated. Ukraine�s Chernobyl atomic power plant, site of the world�s worst nuclear accident, entered 2000 without a technological glitch. And in the United States, three nuclear power plants unexpectedly shut down in South Carolina, Georgia and Pennsylvania as the new year approached, but federal officials said the problems were not Y2K-related. Governments and private businesses worldwide have spent billions to prepare for a potential Y2K nightmare stemming from a programming bug that may cause older computers to read 2000 as 1900, potentially causing systems to malfunction or shut down. Global U.S.-based corporations including Caterpillar Inc. (CAT), Mastercard and Northwest Airlines (NWAC) said Friday that their Asian operations had made the transition to 2000 without apparent incident. 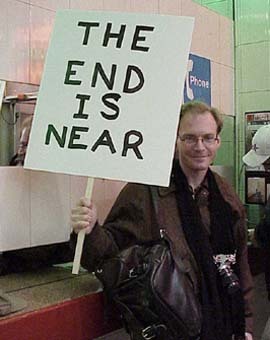 Widespread fear that Y2K would bring mass technological chaos, echoed by the New York reveler near Times Square Friday, proved largely unfounded across the world. In Guam -- the first U.S. territory to cross over into 2000 -- the U.S. Navy and Air Force reported no glitches. Air traffic control worked smoothly on the island, in the first test of the U.S. systems, the Federal Aviation Administration said. FAA chief Jane Garvey, who took flight shortly before midnight struck across the Greenwich Mean timeline, reported that the U.S. air-space system was operating normally at 7:30 p.m. EST. There were also no reported problems from airlines around the world. There were roughly 2,415 planes airborne when midnight rang in Greenwich. Meanwhile, Russian and U.S. military officials working at a command center in Colorado to monitor nuclear missiles said there were no disruptions. President Clinton's top Year 2000 expert, John Koskinen, said U.S. officials are watching closely for computer problems, power outages and other disruptions overseas that might indicate trouble for the United States hours or even days later. It�s virtually inevitable that there will be at least some Y2K-related problems when business picks up next week after the holiday, said Bruce McConnell, director of the International Y2K Cooperation Center. "I think we will see problems on Monday, Tuesday and Wednesday,� he told CNN, citing the possibility of computerized billing and other problems. But as of early Friday evening, the only significant Y2K problem was reported by Delaware gamblers, who found slot-machines at three state racetracks refused to take their bets on horses. The machines, which have a three-day "look-ahead� feature, refused to accept wagers when asked to look forward into the year 2000. However, the problems, first reported Thursday, were fixed within 24 hours. In New Zealand, the first industrialized country to welcome 2000, the only problem reported was congested phone lines as people rushed to call friends and family to deliver New Year�s greetings. "The lights are still on. The situation is normal,� said Basil Logan, chairman of New Zealand�s Y2K readiness commission. The world was watching New Zealand closely as an early warning center. Logan said that as business activity increases throughout the country in mid-January, Y2K could pose further problems. will watch developments over the next few days. In China, telephones, airports and nuclear power plants began 2000 in good working order. Computerized stock exchanges in Shanghai and Shenzhen reported no glitches in their electronic systems. A Bank of China official said the country�s main foreign exchange bank was unaffected. In the Philippines, systems also were reported to be working as usual. Likewise, major banks and energy companies in the United Kingdom reported no initial problems as the year 2000 started at 7 p.m. EST. In Kuwait, oil industry officials there reported oil production, exports and refineries were all operating normally after the stroke of midnight. Similar reports followed from other countries across the Middle East and Greece. The International Energy Agency, the West�s energy watchdog, has warned of oil supply shortages this winter if inventories fell much further. But the agency shrugged off the need for such action late Friday evening. Major U.S. oil companies, including Exxon-Mobil Corp. (XON) and Chevron Corp. (CHV) also reported no problems with their overseas refineries. Likewise, the U.S. securities industry said operations were running very smoothly ahead of the year 2000. The Securities Industry Association said continuing reports from Wall Street firms indicate their computers are prepared to handle the Year 2000 transition. Throughout the world, seaports were closed and planes were grounded. ATM machines in Beijing were closed, while Sri Lanka postponed surgeries in hospitals. Even the Matterhorn roller coaster at Disneyland in California was set to shut down to avoid any possible Y2K problems. Central banks across the globe have printed billions of dollars worth of currency -- from 10 percent to 40 percent more than normal -- to hedge against possible runs on banks. Experts, however, said that the financial sector is well prepared. There were some reports Friday that last-minute shoppers were clearing shelves in Australia, New Zealand, Jamaica, Egypt and elsewhere. Some buyers were preparing for potential Y2K problems; others for holiday parties. But Australia�s central bank governor honored a request from the U.S. Federal Reserve to go public with Y2K-related computer information as soon as possible following the stroke of midnight there, helping create a wave of calm that has thus far spread as far as Western Europe. Meanwhile, the U.S. Defense Department reported that public access was closed to its main Web page -- a service that was intended to reassure the public that Y2K was causing no problems for the Pentagon. But officials chalked up the problem to human error -- not the Y2K computer bug. Also, it was not the millennium bug but a computer hacker who temporarily closed down the much-read Internet timetable page for Britain�s railways Friday. The hacker planted a false report that there would be no train service over the holiday, forcing officials to shut down the Web site for several hours. France issued a last-minute warning about Y2K computer viruses, saying hackers had been unusually active recently and could use the millennium as a chance to release new viruses into computers around the world.